Often we require to share our computer files or directory from one computer to another computer over the network. In the following few steps I will show you how to transfer or share files or directories over the network. 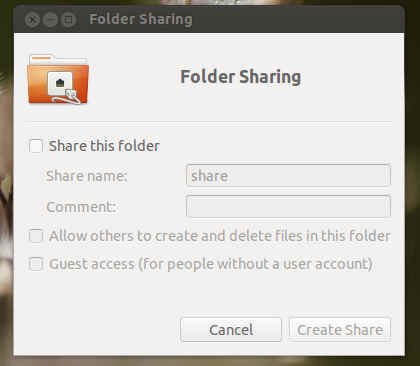 Once you check the share this folder option you may be asked to install additional sharing services by displaying a message like “Sharing service is not installed: You need to install the Windows networks sharing service in order to share your folders.” in a window. Make sure you have internet connection enabled, because the packages will be downloaded from the repository. Click Install Services button to install the additional services. 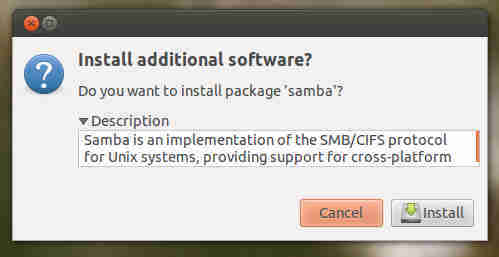 Click on Description, if you want to see what are the additional software packages that will be installed. Enter your super user password to authenticate the installation. Within few second or few minutes(if slow Internet connection) the packages will be installed and you will be asked to choose your preferences of sharing. 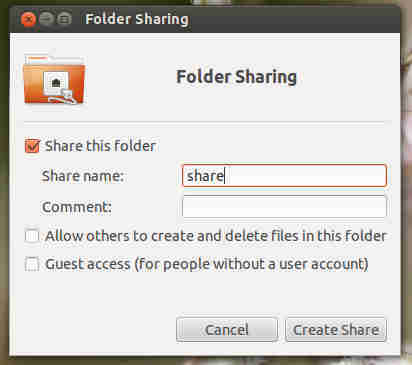 Guest access (for people without a user account): This option allows the guest to access the shared folder. After all click Create Share.